Over the years I have been caught up in “discussions” with several folk about how good high-pressure and ultra-high pressure waterjet streams were as a surface cleaning tool, in contrast with chemical and abrasive use in removing paint and other surface layers. One debate was about cleaning some particularly toxic chemicals from various surfaces. The point that often comes up in these discussions is that of “how clean is clean?” And in this particular case it was stated that the surface could never be completely cleaned. The rationale for that position was because the chemicals would enter into any cracks and flaws in the paint, and could therefore be retained either in the top coat, or the underlying primer. My answer to that was to take a small sample and clean the surface over the first quarter, raise the pressure and remove the top coat on the second quarter, raise the pressure further and remove the primer down to bare metal on the third quarter, and then, after adding a small amount of abrasive to the water, remove a thin surface coat of metal from the sample. It seemed to be a convincing demonstration, though I will come back to one problem in a later post, and for this post I will discuss taking the paint off. It is now reasonably well known that high-pressure water can be cost effective as a way of removing paint, particularly from large structures such as bridges, and ship hulls, but it took a while for some of the benefits to become evident. 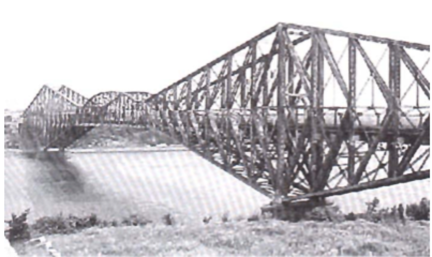 There are 8-million square feet of surface in the bridge. As I noted at the end of the last post, the historic method for cleaning surfaces, and removing deteriorated paint has been to suspend abrasive particles in an air stream, and to use those particles to abrade and erode the paint from the surface. When the paint, rust and other coatings have been removed the job is often considered finished when the surface is restored to a nice shiny surface finish. There is, however, a snag, when one does this. The numbers that I was once given were on the order of: from the time that a railroad wagon was put into service, it would take 5 years before it would require stripping and repainting. After that first treatment, however, the paint would deteriorate more quickly and often within another 18-months the wagon would have to be taken back for repainting. So why is this, and why does high/ultra-high pressure paint removal help extend the life of that second paint coating? I, and the industry, are deeply indebted to Dr. Lydia Frenzel who did a lot of the pioneering work in helping to define the benefits of the technology, and then spread the word about them. The problem begins as the surface begins to corrode, and I will continue to use the wagon as the example, though the result holds true for many surfaces. As the rust and damage continues to eat through the paint and into the underlying metal, that surface is not attacked evenly, but, instead small pockets of corrosion develop, where the metal is eaten away more in the middle or along the sides of the pocket. By the time that the surface is ready to be painted it is no longer, therefore, smooth, but rather is pitted and covered in corrosion. Figure 2. Exaggerated illustration of the condition of the surface, with the overlying corrosion shown in green. When the surface is cleaned with an abrasive, typically driven using an air stream to sandblast the surface, the particles will impact and distort the surface. Thus while the majority of the corrosion will be removed by the impact and scouring action of the abrasive, some will not. Further the impact of the abrasive particles will bend over the weaker structures on the surface as well as peeling over some of the metal on the surface. Figure 3. Electron microscope picture of a piece of metal on the edge of a pass by an abrasive laden stream, so that the action of the individual particles in cutting into and plowing the surface can be seen. Note that this peels over metal edges, for example at the arrows. The peeling over of the surface, and the flattening of it give the shine that used to be the sign that the job had been effectively done. There are, however, two disadvantages to this. The first is that by distorting the surface, the bending over of the metal traps small pockets of corrosion within the surface layer of the metal. Figure 4. Representation of the metal surface after it has been cleaned with abrasive. Note the folding over of metal to trap corrosion products. The abrasive particles are also not small enough to penetrate into the smallest tendrils of corrosion migrating into the metal, and these pockets (green) also are trapped. Figure 5. 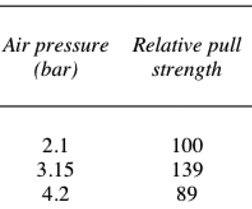 Relative paint pull strength as a function of the pressure of the air driving the sandblasting stream in pre-cleaning the surface of the old paint, prior to repainting. As the table shows, the higher the air pressure then the smoother the surface, and the poorer the bond made with the paint. Now consider what happens when a high-pressure jet cleans the surface. The water does not have the power to distort the metal, but rather does have the ability to penetrate all the cracks and pits on the surface, and flush them clean. As a result the surface is left rough (to give a good paint bond) and corrosion free. Figure 6. Illustration of the relative condition in which a high-pressure waterjet will leave the surface. One of the difficulties that early proponents such as Lydia had in getting the technique accepted, however, lay in the cleanliness of the surface. Because the metal had not been distorted back into a smooth upper surface, it does not reflect light in the “shiny” manner that an abrasive cleaned surface does. Thus to those trained to the latter, it did not appear clean. There had to be a considerable amount of demonstration, explanation and training before it was accepted that this “grey” surface was actually cleaner. And there are now standards, issued by the Steel Structure Painting Council, that recognize this. Figure 7. A primer coated plate (left) that has been cleaned to white metal (right) using a high pressure waterjet. 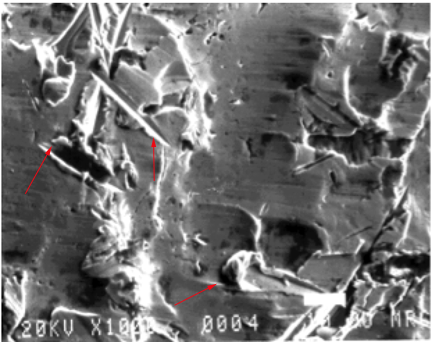 Note that actual microphotos of abrasive and waterjet cleaned metal surfaces can be found in the paper by Howlett and Dupuy (Howlett & Dupuy, NACE Corrosion/92, paper No. 253; Mat. Perf, Jan. 1993, p. 38, the waterjet pressure was 30,000 psi). I think clearing from high pressure waterjet would be good option over sandblasting. As we look up in the demonstrated fig. HOW I GOT RID OF MY 4 YEARS GENITAL HERPES WITHIN 7 DAYS, GOD IS AWESOME! this is not scam is 100% Real. Thanks for the info on Cyclone Water Blaster!